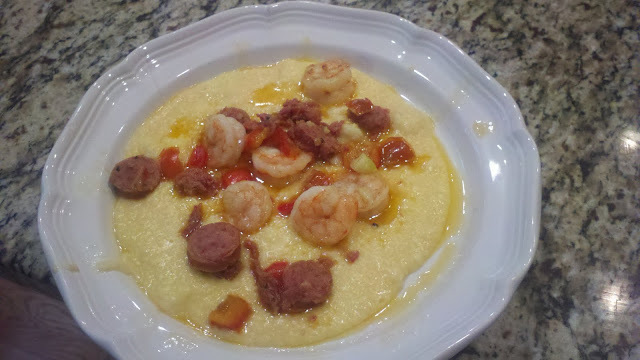 I grew up in Louisiana eating lots of grits (practically every morning), tons of shrimp and the occasional andouille sausage (a spicy Cajun sausage) but I had never had all three of these together until I moved to North Carolina. Apparently it is an original dish to Chapel Hill but just with regular sausage and then someone added the andouille. Anyway, it's amazing.....like the best of Louisiana and NC rolled together, and it's pretty easy too. Here is a recipe that I like.....enjoy! I make something very similar but add 1 can of diced tomatoes to the sausage and shrimp mixture.